Most televisions have a decent set of built-in speakers. But, these speakers don’t compare to a separate sound system. With home theater speakers, you can enjoy movies, sports, and television the way that they’re meant to be enjoyed – with quality sound. If you’re setting up your home sound system, there are several important features to keep in mind as you start shopping for speakers. First, you’ll need to decide between an all-in-one system or a complete surround sound system. An all-in-one system does not require complicated setup. You simply connect your speakers to your home theater. With a complete sound system, you’ll need to arrange your speakers around the living room. A complete sound system will typically include a center speaker, left and right speakers, surround speakers, and a subwoofer. The subwoofer provides the bass, while the arrangement of the remaining speakers help deliver surround sound. Other considerations include the price and the installation options. Some speakers can be mounted on your walls while others may be set on the floor. 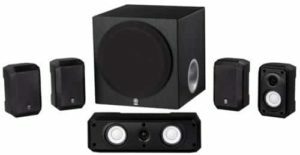 If you’ve got a general idea of what you’re looking for, then compare the details of the top 10 best home theater speakers in 2019. If you want a simple speaker system, this could be the right choice. You only have 2 speakers, which make setup quick and easy. Each speaker includes custom mounting brackets for mounting to your wall. The speakers can be stood upright or positioned on their sides. There are a couple of issues. First, these speakers don’t come with speaker wire. You’ll need to purchase wire separately. Also, while these speakers offer great sound for their size, they don’t compare to some of the high-end speakers found toward the bottom of this list. Overall, Bose speakers provide a simple solution for adding stereo surround sound to your room. But, they are not as powerful as your other options. 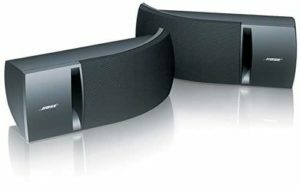 The Bluetooth wireless technology allows you to wirelessly connect devices to your sound system. You can hear every detail as you play movies, games, or listen to music through this speaker system. The system also has advanced sound retriever technology. This allows the system to restore the output of compressed audio, such as MP3, AAC, and WMA audio files. The restored output is closer to the level of CD sound. What about the disadvantages? There are no issues to discuss. You get a great sound system. But, it is a little more expensive than some of the other options in this list. The bottom line is that Pioneer has released another quality sound system. Though, to enjoy this superior sound, you’ll need to pay a little more. This speaker package comes with great satellite speakers. They do a great job of hitting the mid and high range sounds. They also have holes along the back for mounting. But, they are also designed to be placed on a flat surface. The front and center speakers deliver great sound. But, the subwoofer may not provide the bass that you want for playing loud music. Even though the subwoofer delivers 200-watts of sound output, it does not have the same deep bass that you would expect from a high-end speaker set. Overall, this set has a good balance of pros and cons. The only real problem is the quality of the subwoofer. But, the other speakers are still great. You get plenty of sound from these speakers. If you want to create the ultimate home theater, this could be the perfect match. Pure cotton cones are used to provide a fast and accurate response. You’ll also get wire speaker for setting up your system. There is an important drawback. This is one of the more expensive systems in this list. In fact, you’ll pay at least twice what you will for most of the other sets. Other than the cost, this is a great set. In the end, you won’t regret your purchase. This system is quick and easy to setup. You can mount the speakers on your wall. There is a hanging hole on the back of each speaker for mounting. Also, you can connect multiple devices through the inputs located on the back of the system. The disadvantages include the total power of the speaker system. These speakers won’t fill a large room with dynamic sound. But, they should offer sufficient power for a small room. This is one of the more affordable options. This is a plug and play system. It is quick to setup and even features Bluetooth connectivity. Along with these features, the speakers are magnetically shielded. This allows you to place your speakers near your television and other electronics without worrying about damage from the magnetic power of the speakers. What about the disadvantages? Some people have noticed a buzzing sound coming from the speakers when no audio is playing. This seems to be an infrequent occurrence, so it could possibly be a random defect on some of the units. Overall, this is a decent set of speakers. The price is low and the sound is good. It may not be the most powerful speaker system, but it gets the job done. This system is easy to setup. It features plug-and-play inputs for connecting your laptop, MP3 player, or gaming system. It also includes a booming subwoofer with full bass control. You can easily dial the bass up or down. Another great feature is that the speakers can convert 2-channel stereo audio into immersive surround sound. There are a couple of disadvantages to this set. The speakers cannot be mounted on your wall. There are no brackets along the back. This could be an inconvenience, depending on how you choose to set up your speaker system. The other issue is the lack of speaker wire. You get about 6 feet of wire for the front speakers and 15 feet for the rear speakers. In the end, this is an economic choice. It’s very affordable and offers great sound for the price. But, the speakers do lack mounting brackets or holes along the back and you don’t get a lot of speaker wire. The hand polished steel exterior of these speakers ensures durability and helps deliver superior sound. There is a total of 5 satellite speakers, which can be positioned around your room. You have the option to place them on top of a surface or mount them to the wall. As mentioned, this is an expensive set of speakers. That is the main drawback to choosing this set. Other than the price tag, these speakers should meet your needs. Though, this isn’t a wireless set. 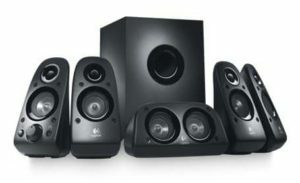 The bottom line is that these are among the best home theater speakers if you’re willing to pay the price. Another advantage is the price. This is an affordable speaker set that delivers exceptional sound. The enclosures are made from a heavy-duty, non-resonant composite material. Magnetic shielding is also included. There are no major drawbacks. But, there are a couple of minor issues. First, this is a wired set. If you’re looking for wireless speakers, you’ll need to choose another option. The second issue is that you get a 50-watt subwoofer. There are more powerful subwoofers available – including the subwoofer included in the next speaker set. All the speakers have magnetic shielding, which protects electronic devices from damage when placed too close to the speakers. 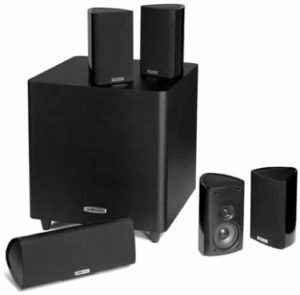 This set also features 5.1-channel surround sound with wide-range system frequency response. You get full, rich sound, whether you’re listening to music or watching a movie. There are no drawbacks to consider. You get a quality sound system at a reasonable price. If there is one potential issue to consider, it’s that the speakers are wired. 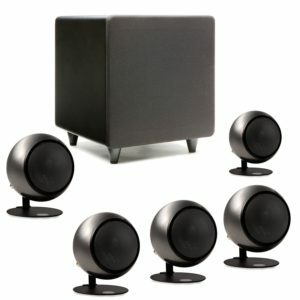 Wireless speakers eliminate the hassle of positioning your speakers based on the length of the provided wire. But, this set does include about 100 feet of speaker wire. Overall, this home theater speaker set offers the best value for the price tag. The speakers are lightweight and easy to mount, while the sound is crisp and clear. No cinema system is complete without home theater speakers. The listening experience is irreplaceable and no movie enthusiast owns a system without proper speakers. Sadly everyone seems to be focusing on raw power rather than audio quality. 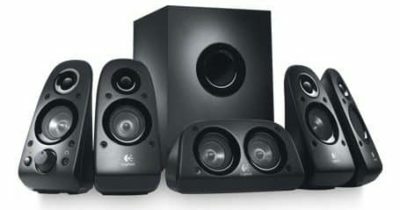 Home theater speakers do not need to be extremely loud especially when used in the living room. With no further ado here are the top 10 best home theater speakers in 2017. The Fluance SXHTB-BK mid-range home theater system with a total rated peak power of 160 watts. All of its speakers are made of matching MDF wood painted in either black of brown. Audio quality is quite decent and for a regular user they should sound just right but more demanding audiophiles will probably look for something in the premium range. 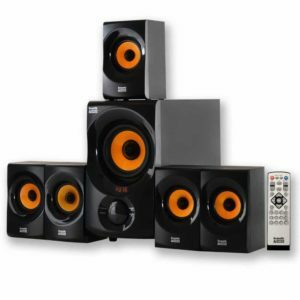 JBL’s CS480 home theater system is a compact model that is mostly made for the ones that need a bit of musical power in a small form factor. They have a rated power of 125 watts for the subwoofer which is more than enough for a living room. They come with shielding and wall brackets to make them easier to mount on a wall. 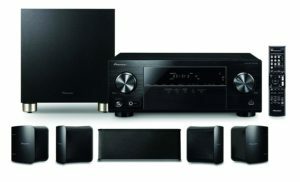 The Sony HT-CT60BT is a compact home theater system with Bluetooth support and excellent sound quality. It is actually a 2.1 soundbar system with a powerful subwoofer and a high fidelity large speaker. The model is easy to setup and can be used as an output for smartphones or tablets that support streaming over Bluetooth. It is also one of the more affordable models on the market. Samsung tends to remove old models and introduce new ones on a yearly basis. The 2015 Samsung HT-J4500 system is actually an all-in-one solution as it comes with everything requires to enjoy 3D Blu-Ray movies. It has an included player and a 5.1 500 watt speaker system that is able to deliver deep bass and high fidelity mids and highs. The Onkyo SKS-HT870 is a great looking home theater 5.1 channel speaker system with wooden enclosures and a lot of musical power. They are able to deliver 360 watts of peak power out of which the subwoofer has 230 watts. The speakers come with bass reflex and with a floor standing mounting system. For a regular home user they are more than enough in terms of power and audio fidelity. Just for the sake of it most regular users prefer to get an all-in-one solution rather than to just get the speakers. The Sony BDV is an excellent model that comes with its own Blu-ray disk player and a 5.1 surround speaker system. Total rated power reaches 1000 watts RMS with a 250 watt subwoofer that comes with a bass reflex system. Yamaha has been leading the industry in terms of audio fidelity for quite a few years. The NS-SP1800BL is their version of a consumer grade sound system that can be connected to any media player. Its subwoofer comes with a bass reflex system and requires amplification. The system itself includes a wall mounting system and has a minimalist design. Energy is not such a notorious brand in the audio field but their products seem to be quite popular. 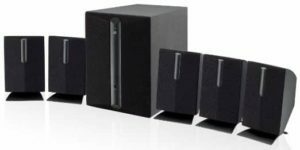 Their 5.1 home theater speaker system is a powerful system that comes in a compact form factor. It has a 200 watt subwoofer with a glossy wooden enclosure and five small satellites. The model comes with a wall mounting system and it requires amplification of 20 to 100 watts. 2. Bose CineMate GS Series II Home Theater Digital SystemLeaving aside the fact that Bose products are a bit more expensive than other models from the same range the audio quality is difficult to match. Their CineMate GS speaker system is a compact and reliable product. It is a 2.1 speaker system that comes with a remote and an improved audio engine. The Yamaha YHT-4910UBL is the ultimate solution to enhance home cinematic experiences. It comes with a 5.1 speaker system and a peak power of 100 watts. The model also includes an amplifier with video pass-through. Its subwoofer delivers extra deep bass which will satisfy even the most demanding users. The mids and highs also deliver unparalleled fidelity and surprisingly the model is quite affordable. 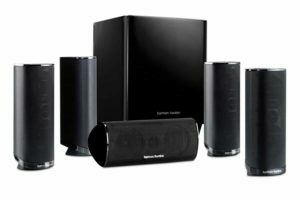 When it comes to home theater audio systems the main difference between them is the power, the number of speakers and the price. As a general rule the audio quality tends to influence the price of the system. Our top 10 includes models that can fit any budget and satisfy even the most demanding audiophile.